MANY biological samples are prone to photo degradation, where the action of light causes changes that can invalidate subsequent laboratory tests. 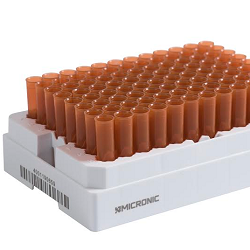 Micronic says that its Amber polypropylene storage tubes ensure the integrity of light sensitive biological samples, even over long-term storage periods, when used in conjunction with a secure screw or push cap. Amber tubes are, as the name suggests, amber-tinted and are available in 0.75ml and 1.40ml sizes. The coloured polypropylene material eliminates sample degradation by exposure to light, but still allows a visual check of the sample, says the company. The tubes are manufactured in class 7 cleanroom, are validated RNase/DNase and pyrogen free, and resist common organic solvents such as methanol, dichloromethane, and DMSO. All this means they can be used confidently to store the most sensitive biological samples, says Micronic. Amber tubes are supplied in an ANSI/SLAS standard footprint 96-position rack and are therefore compatible with most automated sample handling systems. They are available in non-coded or laser-encrypted 2D bar coded formats.